98 Days of Summer – on NOW! 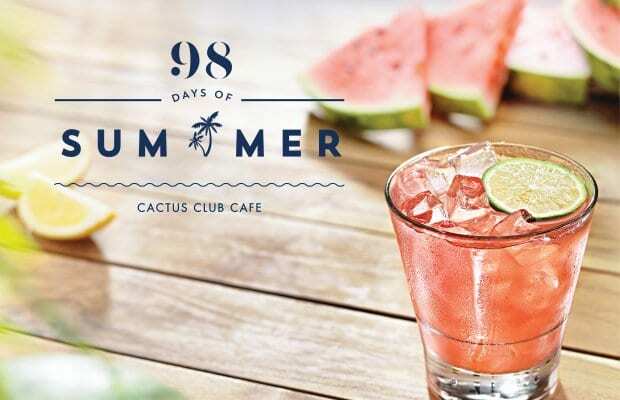 Time to soak in summer flavours – 98 Days of Summer is here, and starts right now. Imagine sitting patio side, enjoying Chef Rob Feenie’s Ceviche (lois lake steelhead, sustainably harvested prawns, red onions, thai basil, mint, cilantro, nuoc cham), while sipping on a refreshing Watermelon Margarita, made with fresh squeezed watermelon juice, served with Cuervo Gold tequila and a splash of citrus. Sounds pretty good, doesn’t it? Find a location near you, and let’s get to it! *98 Days of Summer is available for a limited time at participating locations; menu may vary by location.